If you can learn anything from “A Quiet Place” it’s that getting pregnant in a monster-riddled, post-apocalyptic world is just a flat-out terrible idea. But I guess sometimes you just can’t help yourself. An attractive, but weathered young couple must protect themselves and their young kids from terrifying creatures that prey on anything that makes noise. The couple is played by real-life crouple John Krasinski and Emily Blunt. The gorgeous pair is a direct contrast to the ugly landscape their characters are now living in. And the monsters are extremely scary. 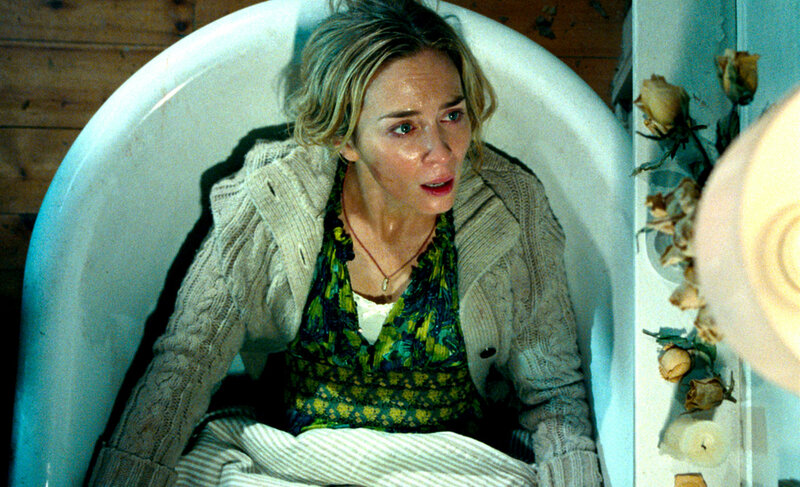 In fact, “A Quiet Place” completely drips with dread from beginning to end, taking the viewer on a roller coaster thrill ride that includes scene after scene of almost unbearable tension. It’s a remarkable genre turn for director/star John Krasinski and a complete detour from his charming work on “The Office.” Michael Scott would absolutely love this flick. “A Quiet Place” wisely doesn’t spend much time on exposition. Anything that’s important is told through the dialogue (most of which is spoken through sign language). The script from newcomers Bryan Woods & Scott Beck (and Krasinski) drops the viewer into a not-too-distant future in which giant creatures hunt by sound forcing people to live completely silently. Krasinski and Blunt are Lee and Evelyn and they’ve got a routine. They walk around barefoot, walk outside on trails of sand, use giant lettuce leafs for plates, and use felt pieces when playing Monopoly. They’ve got young children to look after including Marcus (Noah Jupe) and Regan (Millicent Simmonds) who is deaf. The family mostly communicates through sign language. Which means for a majority of the time, you’re essentially watching a silent film. But they’re human after all and accidents happen. And that’s when THEY show up. The nightmare-inducing monsters are brought to life through fantastic special effects. Krasinski directs with an assured hand. It’s not his first time at the rodeo, having directed a couple other small features and a few episodes of “The Office” but he’s never made anything quite like “A Quiet Place.” Sure it shares similarities with other films in the genre (it’s sort of feels like “The Road” meets “Jurassic Park”) but the film doesn’t feel like anything you’ve seen before. The film is a masterclass in genre filmmaking. The sound design is impeccable. Just try snacking on popcorn or nachos while watching this flick, I dare you. The silence is practically deafening until the roars of vicious creatures fill the auditorium. And the music. Marco Beltrami’s monster mash score is brilliantly used and creates excruciating tension. The family has all relatively smart, resourceful people, but at one point all hell breaks loose as they must battle obstacle after obstacle as their home becomes a target of the menacing monsters. Don’t forget to breathe.